Barbour Publishing has published a juvenile fiction novel called Diary of a Real Payne Book 1: True Story, by Annie Tipton. As a family, we received a complimentary copy of this book so that we could read it and then tell you all about it! The book is 192 pages and is about a 10 year old girl named Emma Jean Payne (EJ for short). Part of the book is written in the first person, as if we are actually reading pages out of EJ’s diary. The rest of the book is written like any other book that is just telling a story and it tells the story about all of EJ’s adventures. I chose to use this as a read aloud. My daughter is 11 (6th grade) and into much longer books (She already read all the Percy Jackson books and is now waiting on the second book in the Heroes of Olympus book to be returned at the library so she can start on it.) And, my son is not a reader. I think he would enjoy it if he ever gave it a chance, but every time I ask him to read something he moans and groans as if I have just asked him to clean out the gutters. He is not moaning and groaning when I get this book out! Now, I will say, he still won’t admit he likes the book…BUT, he sits quietly while I read it and he doesn’t roll his eyes or seem annoyed. Let me tell you, THAT is an improvement. I always struggle with book reviews… I don’t want to give away what happens in the book! I have read book reviews where after reading it, I kind of felt like there was no point in me reading it. I already knew what was going to happen! I don’t want to do that to you here. I will just say that this book is about the adventures of EJ. She is a VERY creative 10 year old with a VIVID imagination. She can be sitting with you one minute, and the next minute be in the middle of a nascar race, not having any awareness of the fact she is still sitting with you! One wonderful thing about this book is that it mentions God and biblical stories often. EJ’s dad is a preacher at their church. Her mom works in the kids church. It is all just normal life to them to talk about God and relate anything going on back to God. That’s a nice thing to see in a child’s book. And it’s especially nice to see it done in a non-cheesy way. So often, Christian books and movies are so cheesy. In movies, the acting is cheesy and in books, the storyline is no good. The author of this book does a beautiful job of just integrating it into what is happening in the story. And, isn’t that how it works anyway? If you are a Christian, God is just naturally going to be a part of your daily conversations with your kids. That is how it happens in this book, as well. I do recommend the book to any child. My 11 year old has enjoyed it (and the 9 year old is coming around!). What is it? 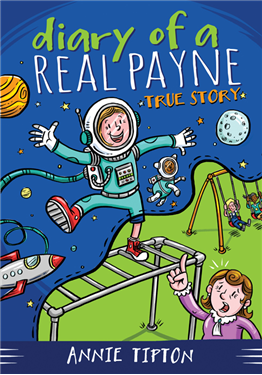 a children’s book called, Diary of a Real Payne Book 1: True Story, written by Annie Tipton and published by Barbour Publishing. How much is it and where can I buy it? It is currently $4.49 and you can purchase it on Barbour Publishing’s website.